A well-documented account follows the thread of ambition, pride, and betrayal that drove an unparalleled explosion of arts and architecture in Europe’s 17th-century cultural capital. Give Morrissey, with 20 years’ architectural writing experience, credit for not just gleaning cogent commentary from previous volumes on the output of his two subjects but for enhancing it. His handling of these personalities and their divergent careers brings fresh passion (and a sense of their frustration) to the remarkable tale of two gifted talents drawn to Rome at the height of ecclesiastical extravagance (if not corruption) that sought expression in marble, bronze, and grand designs. Giovanni Lorenzo Bernini (b. Naples, 1598) was the son of a Florentine sculptor; Francesco Castelli (b. Swiss-governed Lugano, 1599), who would change his name to Borromini, was a stonecutter’s son who honed his talents in Milan. When both arrived in Rome before 1620, Bernini, his work noticed by the influential Borghese family, was presented to the Pope, while Borromini went to work for a relative, Carlo Maderno, an architect charged with the daunting task of rebuilding the ancient church of St. Peter’s. What began as a partnership between the two on the St. Peter’s project was altered forever by the death of Maderno, when Bernini was tapped as chief architect and designer. 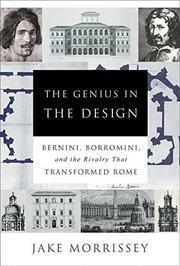 He was less technically competent as an architect than Borromini, Morrissey notes, but had papal favor, and thus began a time where Borromini’s designs and conceptual input were subtly incorporated, sans credit, into Bernini’s resume. The resulting antagonism was to last for their entire professional lives, but the real difference as Bernini’s star rose and Borromini’s did not in a golden age of clerical commissions, Morrissey suggests, is that “if Bernini had perfect artistic pitch, Borromini was socially tone-deaf.” In the end are Bernini’s anointing as the period’s greatest artist, Borromini’s ghastly suicide. Gripping soap opera tells a tale of the Eternal City’s artistic transcendence.